The Department of Archaeology at the University of Amsterdam recently launched a new website “Byzantine & Ottoman Archaeology: Digging up answers in the Medieval Mediterranean” as the official site for their VIDI-Research Project on material culture in the eastern Mediterranean after antiquity. The project researchers Joanita Vroom, Fotini Kondyli, and Yasemin Bagci are examining the ceramic artifacts at four major settlements of the Byzantine and Ottoman Mediterranean including Athens, Butrint, Ephesus, and Tarsus. A little over a week ago this Amsterdam group hosted their conference, “Fact and Fiction in Medieval and Post-Medieval Ceramics in the Eastern Mediterranean – Are we on the right track?,” with papers exploring the relationship between ceramics and coins, and pottery and identity. 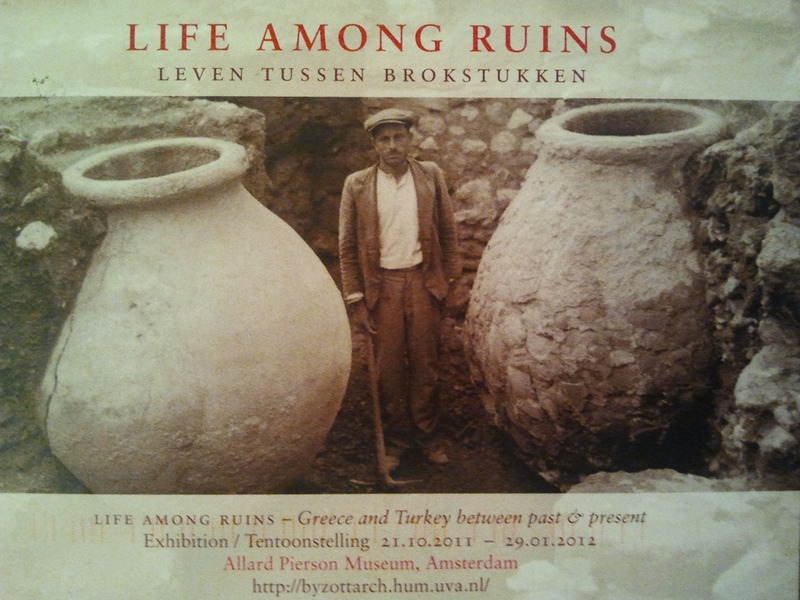 Corinth enters the picture because the conference organizers chose the time of the conference to launch a new exhibition at the the Allard Pierson Museum of the University of Amsterdam called Life among Ruins: The Eastern Mediterranean in Word and Image (ca. 700 – 2000 AD). The exhibition, which will be on display from October to late January, explores the interaction of post-antique populations with the antiquities that always surrounded them. The exhibition includes photographs of the ASCSA excavations in the Athenian Agora from the 1930s-1950s and “drawings, sketches and maps of European travellers, who visited the Eastern Mediterranean between the 17th and 19th centuries. These illustrations come from printed books and maps of the ‘Bijzondere Collecties’ of the University of Amsterdam”. The first illustration one sees at the site is a drawing of the Temple of Apollo against the background of Acrocorinth. The image comes from John H. Allan’s A pictorial tour in the Mediterranean: including Malta, Dalmatia, Turkey, Asia Minor, Grecian Archipelago, Egypt, Nubia, Greece, Ionian Islands, Sicily, Italy and Spain (London, 1845, 2nd edition). The drawing shows literally “life among ruins” as several men, a horse, and donkey casually interact over the buried remains of the Temple of Apollo, with a few scattered houses in the background below the slopes of a towering Acrocorinth. The Temple of Apollo and Acrocorinth with its fortifications are the backdrop to human interactions and habitations. To see the image and others in the catalogue, check out the website here.